When I download a browser such as Mozilla, it comes bundled with several root Certificates. How do I trust that these certificates are legitimate? How do I know that my download does not contain some fake root certs? I know that the software itself will go through an integrity check during the download (which rules out any tampering), however the integrity check itself relies on my existing browser trusting the browser which is being used to download Mozilla over HTTPS. Basically the Mozilla download itself relies on some other root certificate required somewhere during the download process. It seems to be a recursive problem. So my question is how do I trust the root certificate built into my browser? That being said, it is all we have for now, so panicking won't help. If you're concerned that the program that you just downloaded also installed some malicious root certificates, there are scanners available to check them, such as this one and this one (Note: I can't recommend any of these because I haven't tried them, so do your research). Or, if you wish to scan them manually, a pretty good list is maintained by Microsoft's Trusted Root Certificates Program. 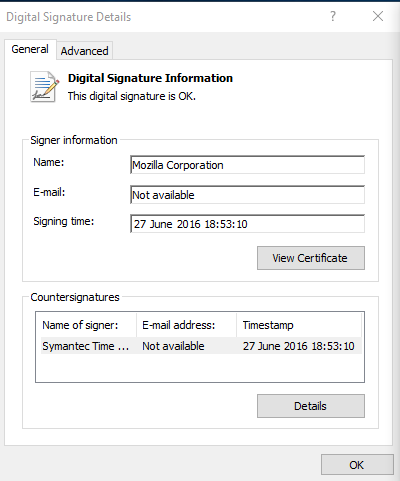 Then, click on "Details" to see more, you will see "Signer Information" and whatever it's "OK" which is checked with Windows built-in certificates. 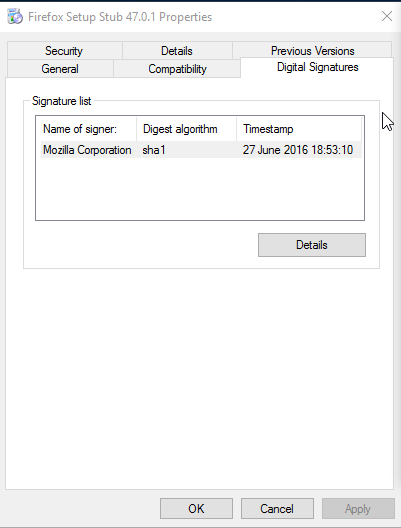 Check if name of signer is "Mozilla Corporation"
Check if digital signature is "OK"
It seems Firefox binary root cert in the chain is this: https://assured-id-root.digicert.com/info/index.html - there's matching Thumbprint "05:63:B8:63:0D:62:D7:5A:BB:C8:AB:1E:4B:DF:B5:A8:99:B2:4D:43". Similarly you can check every root certificate if you have doubts. Not the answer you're looking for? Browse other questions tagged tls web-browser certificate-authority integrity or ask your own question. How to check the authenticity of the root cert of some CA?